I love to brew, and build upwards of ten Modern decks every week. Most of them aren’t very good, which is why I’ve only written about a few on Modern Nexus; I think brewing is a numbers game, so as long as decks like Temur Delver and GRx Moon emerge from a sea of goofier ideas like Temur Rogues, I’m happy. Like most brewers, my favorite thing about spoiler season is the chance to update my decks with newer cards. But it doesn’t always take a fresh expansion to get me de-sleeving and re-sleeving—often enough, existing cards pop into my head unexpectedly, and alter the way I approach my decks. This happened last year with Curiosity, which ended up substantially buffing Temur Delver against what us tempo players call “the BGx menace.” Last week, it happened again with Mutagenic Growth, a card that may finally revitalize the deck I played all through Treasure Cruise winter: Counter-Cat. I cribbed the name from Josh Utter-Leyton’s pre-Innistrad, Green Sun’s Zenith-powered Zoo deck. Today’s Counter-Cat is a Delver deck slanted towards aggressive starts. Just as Hooting Mandrills allows Temur Delver to play a functional “eight Tarmogoyfs,” Counter-Cat employs Wild Nacatl to double down on Delvers. This article explores my history with Counter-Cat, unveils my current build, and ponders the deck’s possible future as another viable grow strategy. The February 2014 Wild Nacatl unban inspired me to try a tempo-focused grow shell in Modern for the first time. Until then, I had been playing midrange-y Temur Delver decks. Temur had little choice but to dip into haymakers like Vedalken Shackles thanks to a lack of efficient threats like Hooting Mandrills. Wild Nacatl and Delver of Secrets had never been legal in Modern together, and the idea of a deck with eight hyper-aggressive, turn-one threats I could ride to victory made me giddy. I developed Counter-Cat with some fellow tempo enthusiasts overseas, and played it for almost a year. My first build ran 3-4 copies of Snapcaster Mage, and played games in two phases. Phase one involved sneaking in damage with Delver of Secrets and Wild Nacatl, and rebounding with Tarmogoyf if a turn-one threat ate Lightning Bolt. Path to Exile helped keep the ground clear for Wild Nacatl, and countermagic kept opponents from setting up blockers. Phase two saw me burn opponents out. If opponents clogged the ground or otherwise answered my attackers, I could switch gears and start throwing burn at their heads, with not just a little help from Tiago. Lightning Helix complimented the set of Bolts when it came time to get doming. I also ran two Boros Charms in this build, since it excelled in both phases, protecting creatures from Abrupt Decay, Oblivion Stone, and Supreme Verdict early on and dealing a whopping four damage later. The Hooting Mandrills spoiler excited me greatly, prompting me to preorder about a hundred foil copies and slot a pair into Counter-Cat. A 4/4 for G is just what the doctor ordered in this kind of deck, but I quickly ditched Mandrills for Treasure Cruise and rode the party boat until Wizards shut us down the following January. Counter-Cat performed well in a UR Delver-packed metagame, since it boasted relative immunity to Pyroclasm compared with Young Pyromancer decks and could even pack the sweeper itself. Post-ban, Counter-Cat featuring Hooting Mandrills never got its time in the sun. I liked the cards enough to try plenty of different builds, including ones with more burn, more countermagic, more creatures, and even Disrupting Shoal. One problem kept surfacing: if our turn-one threat got removed, flooding on Remand and Mana Leak could uncomfortably force us into a midrange role when we’d rather be attacking. Since Delver and Nacatl cost one mana, they needed to survive a one-mana removal spell for us to reliably untap with them and actually get to use those Remands properly. Lightning Bolt was Public Enemy Number One in this case. Enter Mutagenic Growth. Growth pumps 2/2 Wild Nacatls or flipped Delvers past the ubiquitous instant, buying us enough time to untap with a threat and get the beats rolling. Some preliminary testing indicates Mutagenic Growth might prove to be this deck’s Disrupting Shoal—the glue that holds everything together. Counter-Cat’s cards fall into one of five categories: threats, removal/reach, permission, selection, and mana. Cantrips help us find the piece we need at a given time to make sure we can continuously pile on damage with our creatures. Threats form the basis of any tempo deck. As efficient creatures get printed, brand new tempo decks become viable. Counter-Cat is a deck that could not exist in Modern without its infamous common beaters. Nacatl and Delver make this deck tick. When we open two or three one-drops, Counter-Cat plays like a super-Zoo deck, slamming the creatures quickly and overwhelming opponents with their hugeness. Zoo wins some games by leading with Goblin Guide, and following up with Wild Nacatl and Kird Ape. Leading with three Nacatls is another game entirely, especially when some of them fly. Delver is the better of our two one-drops, since he has evasion and can transform on just one land (Nacatl asks us to make a second land drop before growing to Nimble Mongoose-size). Still, it’s better to lead with Nacatl if we have Mutagenic Growth in hand and expect Lightning Bolts. That way, we can Misstep the Bolt and chase our attack with Delver of Secrets, leaving our Boltless opponent to deal with two great threats instead of one. Nacatl is better than Delver with Mutagenic Growth in general, since he gets to chow down on Siege Rhino and Tasigur with some help with the instant. Our one-drops terrorize decks that can’t remove them, like Ad Nauseam or Eggs. But against decks with removal (i.e. most of them), Tarmogoyf and Hooting Mandrills are our most important creatures. They dodge many removal spells themselves, including Lightning Bolt, and consistently come down for one or two mana to clean up the mess left by Terminates and Decays. Growth also improves these creatures significantly; Goyf doesn’t have to worry about contemporaries across the battlefield anymore, and Mandrills runs over just about everything at 6/6. Snapcaster Mage isn’t quite a threat, but he provides too much utility in this kind of deck not to run. These four colors grant us access to just about every spell we could want to flash back in Modern, including Bolt, Path, Helix, Remand, and of course, Mutagenic Growth. Since Growth costs Phyrexian mana, Snapcaster casts it for free. I’ve believed for a while now that Modern has three viable grow decks, each with its own strengths and weaknesses. Thanks to Disrupting Shoal and Stubborn Denial, Temur Delver (specifically, Monkey Grow) shines brightest against linear aggro and combo decks. Blood Moon and Huntmaster of the Fells give that deck enough flexibility to take on most other decks in Modern, too, making it the most robust of the three. I still haven’t forgotten about the Day’s Undoing-featuring iGrow, an aggressive Young Pyromancer vessel that preys on hand advantage-based midrange decks like UWx Midrange and Grixis Conrol. Counter-Cat’s natural white splash gives it Path to Exile, and subsequently, admirable matchups against creature-focused strategies. Path-Snap-Path allows us to easily take on a midrange role in those matchups, and our inclination to apply pressure early puts combo-esque synergy decks like Abzan Chord on a decisive clock. As long as we pace our disruption wisely, Path rarely interferes with taxing counterspells like Spell Pierce and Mana Leak. Lightning Helix is a must-include in Counter-Cat because of the damage we take from our manabase. With Gitaxian Probe in the mix, it’s not uncommon for us to start games at 12 life. Against linear aggro decks like Burn or Gruul Zoo, we need a way to gain some of that life back while meaningfully disrupting opponents. Helix fits this bill perfectly, and I like a third copy in the sideboard for the matchups it truly works in. Older builds of Counter-Cat played 8-10 counterspells, depending on the metagame. Mutagenic Growth takes over some of our counter slots, since it’s functionally Mental Misstep in many scenarios. Spell Pierce is a counterspell that punishes opponents for not taking their time. If we apply enough pressure, time becomes a luxury opponents can’t afford to spend. With Growth helping ensure the on-board presence of Insectile Aberration or Wild Nacatl, Pierce skyrockets in value. One-mana counterspells are also great at winning stack wars. Spell Snare joins in here, hitting power cards like Snapcaster Mage and Tarmogoyf or just forcing our own key cards through lowly Mana Leaks. Remand and Mana Leak make the cut as ways to answer big cards. Haymakers like Karn Liberated and Thragtusk can put spokes in any fair deck’s gameplan, and these two-mana counterspells answer them as elegantly as anything. As for numbers, I’m always hesitant to say I’ve optimized a deck. By now, I swear by the 4/3/3 Shoal/Leak/Denial split in Temur Delver, but this build of Counter-Cat is too fresh for me to make a similar claim. I will say that so far, I’ve enjoyed the versatility of a 2/1/1/1 Pierce/Snare/Remand/Leak split with Snapcaster Mage. Negate earns some spots in the sideboard for matchups where we want less removal and more countermagic. Most combo decks struggle to remove our threats, preferring to race us instead; countermagic makes it very difficult for them to succeed. It grows an early Tarmogoyf past Lightning Bolt. It flips Delver of Secrets. It allows us to run fewer lands. It gives us something to do with Snapcaster Mage for zero mana in a draw-go stalemate or an otherwise tight spot. It lets us know whether we should dig for protection like Mutagenic Growth before committing threats to the board. It provides perfect information so we know how to pace Spell Pierce, Spell Snare, Remand, and Mana Leak, as well as whether to hold up permission/removal or to increase our board presence. On paper, the life we pay to cast Probe mostly matters against damage-intensive decks like Burn, but Counter-Cat already has a favorable Burn matchup. I’m fine with slightly weakening our Game 1s against that deck to reap the benefits of running Probe against everyone else. One of Counter-Cat’s most daunting aspects is the manabase. This deck frequently operates on just two lands, but has trouble winning on just one. Ideally, it wants to set up “perfect shocks” (Temple Garden + Steam Vents, or Hallowed Fountain + Stomping Ground) as quickly as possible, then supplement the combo with a third land (often basic Island). Garden + Vents is the preferred combo in this build, since every fetchland grabs either half, and that pair casts Destructive Revelry from the sideboard. That said, some openers call for Fountain + Ground. I don’t like Breeding Pool and Sacred Foundry in this deck, since that pair doesn’t cast Boros spells like Lightning Helix. The benefit of playing Breeding Pool—being able to cast more spells on one land—doesn’t appeal to me either, since Wild Nacatl is pretty lackluster with just a Pool in play anyway, and the deck struggles on one land regardless. 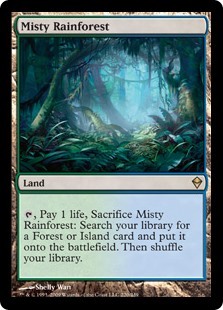 Misty Rainforest is the deck’s best fetchland, grabbing every land in the deck. Arid Mesa gets every shock, but no basics. I like to max out on Flooded Strand, since the blue-white fetch simplifies setting up Garden + Vents (+ Island). Scalding Tarn, a staple in most UGrx tempo decks, doesn’t always cut it in Counter-Cat, as it never finds Temple Garden. When I take this deck to tournaments, I get more comments on the manabase than anything. As a Blood Moon lover myself, I like to think I know how to control for greed when I build a manabase. Four-color manabases in Modern are only safe if you have a way around Blood Moon, which Counter-Cat does: get under it. Especially with Mutagenic Growth to protect against Lightning Bolt, we’re thrilled to see opponents tap out on turn three, since it means another attack from our jungle squad. Revelry comes in to deal with Moon against decks we want Path to Exile for, and the rest of the time, it’s fairly easy to fetch out a Forest early and play a wonky Gruul deck. Opponents expect Moon to buy them time, but if we can still deploy Nacatls, Mandrills, Goyfs, Growths, and Bolts, they won’t gain much. Revelry can be cast off Forest and any land-turned-Mountain to unlock a hand full of cantrips, and Isochron Scepter gives us a way to cast Helix and Path without a white source. My advice to anyone taking this deck for a spin: pay close attention to the way you fetch and the ramifications of your choices. Remember to pace the most valuable fetchlands, and keep in mind how the value changes as your lands get fetched out. For example, if you have basic Island in play, Arid Mesa becomes strictly better than Flooded Strand, which doesn’t fetch Stomping Ground. Counter-Cat’s sideboard allows the deck to become a “hate machine” for Games 2 and 3. Against creature decks, our Spell Pierces become extra removal spells; against combo, Mutagenic Growth and Path to Exile tag out for Negate and more burn spells. I often approach sideboards in terms of packages. In Counter-Cat, I also pack specific types of cards—counterspells, burn—to improve the reliability of certain plans I want to employ in a given matchup. Huntmaster package: A carry-over from Temur Delver, the Huntmaster package comes in against grindy attrition decks and damage-based creature decks alike. This card does so much work I’m always amazed more decks don’t play him. Revelry package: I favor a 2/1 split because Ancient Grudge is too good against artifact strategies not to run, but Destructive Revelry is usually better in Counter-Cat. The spell answers pesky enchantments like Blood Moon as well as nastier stuff like Choke and Batterskull. Isochron Scepter: Counter-Cat can’t play its own Blood Moons for free wins against greedy decks, but Isochron Scepter is almost as good in many matchups. Imprinting Path to Exile or Lightning Helix against a creature deck usually wins the game on its own, and Remand or Negate against spell-based decks keeps opponents from messing with Wild Nacatl or from winning themselves. I prefer Scepter in the board because we don’t want it against decks with Kolaghan’s Command. Game 1 is usually faster than Game 2, meaning we won’t necessarily have enough time to extract full value from the Scepter without dying to linear opponents. Scepter can also go back into the board once opponents have seen it, possibly causing them to bring in now-blanked artifact removal. Negate: It turns out two-mana Stubborn Denial isn’t so bad. Increases our counterspell density against decks like Ad Nauseam that don’t care about Path to Exile. Also stellar against creature decks that rely heavily on noncreature spells, like Collected Company. Boros Charm: An anti-midrange plan that helps us burn opponents out once they clear the ground. Also protects our threats from destruction effects, and the double strike mode can be relevant sometimes—with a 5/6 Tarmogoyf, with a trampling Mandrills, or with Insectile Aberration against a horde of Lingering Souls tokens, for example. I’ve experimented with Mutagenic Growth as a way to counter Lightning Bolt in Modern before. I tried Growth with Mantis Rider, and my last project with the card ran it alongside Goblin Rabblemaster in a ritual-fueled GRx Moon deck. Rider and Rabblemaster don’t meet my guidelines for benchmark creature playability by themselves, so it stands to reason that Growth is much more impressive when it supports Boltable creatures good enough to see Modern play on their own merits. Ten days of grinding with this new build of Counter-Cat seems to confirm this hypothesis, but I’ll have more insights in a week or two. Until then, don’t be afraid to get brewing yourself, even well before Eldritch Moon spoilers start to surface. Modern continues to amaze me with its vast card pool and wealth of deckbuilding possibilities, and dusting off old favorites is a great way to bite into the format. Your own Disrupting Shoal might be right under your nose! All these JB decks are starting to look the same. You added a color, 4 Nacatl’s, and shaved some spells and 2 Hoots… how is this better/different than Temur Delver vs the current meta? I think that is the important part that’s missing. I think issue is that this author brews just to brew. Anyone can jam a handful of cards together and call it a deck, but tell me why this deck/brew could be well positioned in the meta. Otherwise, its just another deck that gets crushed by Abzan CoCo, Tron, and Burn. There seems to be good thought into making it a well rounded deck, but nothing about it being competitive. A brew should have a purpose, right? I’d be much more impressed if there was a section that explains why Counter Cat has game against the top decks. Frankly, i dont think it does. This isn’t some new brew – I’ve been working on Counter-Cat for over a year now. I figured Temur Delver was strictly better since the Treasure Cruise ban, as my testing has also suggested. But so far, the inclusion of Mutagenic Growth seems to make this deck viable. I totally agree with you—brews need to have a purpose. But there are reasons to play Counter-Cat over Temur Delver. Here’s how I’ve been faring against the top 10 decks in Modern. The hardest matchups are Living End and Dredgevine, which don’t show up a lot lately. Interestingly, the three you predicted would be bad matchups are actually some of this deck’s best. Temur Delver struggles against midrange decks like Jund and Abzan, and against big creature decks like Zoo. Counter-Cat shores up those weaknesses in exchange for what amounts to a few points against Tron (also solvable with a couple more two-mana counterspells), and that’s why I think it has game going forward. I actually had something like this in the article initially, but I decided to save it for later to keep the article more focused, Since I’ve turned my attention almost fully to this deck, you can expect some more in-depth analyses of its role in the metagame in the near future. In this article, I mostly wanted to introduce Counter-Cat to the Nexus readership and address some of the FAQ’s I’ve received about it since I first developed it, including how the mana works and how the deck plays. If there are no unfavorable matchups, why aren’t other people playing it? My guess is because there *are* unfavorable matchups. A T3 blood moon shuts off nacatl and locks you out of your spells. Sure, you have isochron scepter and negate, but you can’t reasonably except to get them on time in games two and three. And how exactly is the burn or Zoo matchup good? You said yourself that you start at 12 life not infrequently. Two MB helixes and one in the side is NOT enough to make a difference. Now, modern Nexus holds itself to a higher standard than that, but unless you explain why a deck that starts at 12 life has a favorable burn matchup, you can’t say it has a favorable burn matchup. Saying you have helixes to offset lifeloss is not enough (especially when you play only two) to back up such a claim. If you’re genuinely interested, Counter-Cat’s storied history is pretty well documented in this thread. Read through and you’ll find answers to all your questions, or just wait a couple weeks for some more data-backed articles about the deck. A lot of your claims were directly addressed in this very article, though, so I won’t go too deep into answering these concerns right now. In that case I’ll wait for your future articles. My issue is not that you did not address my concerns, but that I was not satisfied with the way they were addressed. Don’t get me wrong, I’m rooting for you. Any deck where I can sleeve up nacatls and remands sounds like a great time. It’s just that I am very wary that it can succeed in the hyper aggressive world of today’s modern. 1) Especially with 3 Probes, you do not need the 18th land (aka the basic Forest). If you really want it, I would consider to run it in the SB (same reason why you run the basic mountain in the Monkey Grow Sb atm). If you insist to run the basic Forest in the MD, pls run that darn Faithless Looting. 2) Only 2 Mandrills IS atm a mistake, you really need that Trample effect, especially vs Abzan CoCo (which is not a good match-up btw, it is decent, but not good) OR you could just run a Rancor MD, which I do atm (and it is awesome). 3) Regarding the countersuite, yes I can understand, that the Mutangenics are basically Mana Leaks/Mental Misteps vs Bolts and creatures, but than again, that Remand is bad. Trust me, Mana Leak is especially in a shell which you are currently playing waay better. Also, I would switch the 4th Muta for the 3rd Leak, since the 4th Muta is not that good (I tested it last year August). 4) Not a fan of the SB. Huntmaster IS bad and just slow. Send to Sleep does the “same” job but better (it is only worse against Burn and for Burn Huntmaster is either way really slow). I also miss that 4th Helix in the SB. It offers so much against way to many decks. 1. 18 lands: I auto-mull just about every hand with four or more lands in a blind game. That’s led me to test 17 lands countless times and I always keep coming back to 18. Why? This deck really struggles when it doesn’t make its second land drop, and it gets even better when it makes its third and fourth, thanks to Snapcaster Mage. 18 lands also lets us run Huntmaster scot-free out of the board. And finally, it gives us room for basic Forest, which is one of the most important lands in the deck. Against aggressive strategies like Burn, Forest is crucial for deploying multiple creatures per turn without taking too much damage. I also think you underestimate Blood Moon in Modern. Having just a Forest and a pile of Mountains lets us navigate under a Moon, whereas having an Island won’t let us do anything. Moon really wrecks this deck if we don’t have access to green. 2. 2 Mandrills: This card is really good. It’s especially good in this deck. I’ve tried three more than once and have flooded on Mandrills each time. If I’m not mistaken, don’t you play 3 Sleight of Hand and a Faithless Looting in your list? Those cards make the third Mandrills a lot better, but I simply can’t support one in this build. Also keep in mind that I have more threats over the course of a game vs. removal-heavy decks, since Bolt protects my creatures, so the third Mandrills is less important. 3. Counter suite: I started with one Growth, then went to two, then went immediately to four, and haven’t looked back. I just always want to draw it. When I always want to draw a card, I play four of it. Sure, it gets boarded out against decks without Bolts. But decks without Bolts have a really hard time beating NacatlDelver.dec regardless. As for Remand, I love it on a Scepter, but other than that I can see it being a Mana Leak. I said in the article that I’m not sure about the counterspell configuration. All I know for sure at this point is that I want four Growths, a pair of two-mana counterspells, and at least 2 Spell Pierce in the main. 4. Huntmaster: I actually don’t think Huntmaster is slow vs. Burn, and really love him in that matchup. Running three of them lets me have a highly reliable Bolt their guys, then drop Huntmaster plan that’s been great for me in testing. I also love Huntmaster against attrition decks and with the four Muta Growths main, since he’s a great target for them. As you know, I tested Send to Sleep when Origins came out, and was really impressed with the card. But it’s only stellar during board stalls, which Counter-Cat doesn’t have that many of thanks to Path-Snap-Path. Huntmaster is also good during board stalls, but since he has so much applicability elsewhere (vs. attrition and small aggro decks), I prefer him for now. For what it’s worth, the fourth Helix also becomes less important with three Huntmasters. That said, going forward, I’m paying a lot of attention to both the Huntmaster and Scepter plans in the sideboard to see if I need to cut those numbers for anything else to solve specific problems. Lastly, I want to say that even though we’ve been working on this deck for more than a year, it’s not optimized. That we can have so much discussion about the card choices shows us that there’s still a lot to learn and tighten up. That’s why comments like “it’s bad, I tested it” can be unproductive. Take Abzan Company matchup, for example: I also tested it, and actually found it to be quite good. Granted, I had Huntmaster/Scepter to help out in Games 2 and 3, which pulled a lot of weight. I just want you to acknowledge that there are many paths right now. It’s pretty tough to nail down a best list for Counter-Cat, since we have so many options available to us in four colors. But I won’t give up, and surely, neither will you! What would be the strengths of this deck over something like domain zoo with Geist and siege rhino? I know there’s a bigger creature suite and less countermagic in the zoo list, but it seems like they might play out in similar fashion. You lose the one-mana delver threat, but the possibility for a turn-two Geist off a mana dork seems nice, especially when you can get exalted on a solo attack. Plus, being able to take out big threats like tribal flames is a huge plus. I’ve always enjoyed your decks. I’m not good at playing them, but I like the strategy. Domain Zoo is actually not a big leap. Etymologically, I think it’s the closest deck we have to Counter-Cat in Modern. In fact, the original version of this deck sometimes played Tribal Flames in the main with a Watery Grave. I ended up favoring Boros Charm, since Path answers big threats and Charm is more versatile in “Phase One” (protect a creature, get in a lot of attacks). – We’re better against unfair decks. Having eight Delvers is huge here, and the mainboard permission obviously wins us lots of games vs. combo decks. I’ve not know Domain Zoo decks to play any permission main, but to sometimes run Negate in the side. – We’re not soft to Pyroclasm. Hierarch into Geist decks are very soft to Pyroclasm. One major upshot of this bullet point is we get to run Pyroclasm ourselves, and it’s one of the greatest sideboard cards in Modern IMO, especially in a deck that’s so good of trading one-for-one with threats (via Path, Helix, Bolt, etc.). Clasm gives us a way to also answer decks that go wide, like Gruul Zoo. – Our manabase is a lot more stable. Sure, we only run 18 lands, but as I say in the article, we can operate under Blood Moon with just a Forest. The Siege Rhino/Geist deck has a way harder time doing this. – We get to play a lot more real cards. Decks with so many three- and four-drops have to not only play those cards, but run extra lands and mana dorks to make sure they hit the board. All that mana severely cuts into the “actual card” count, softening the deck to grindy midrange strategies that want to trade resources. In my experience, Domain Zoo ends up flooding out against these decks if it can’t quickly land a Geist and ride it to victory. I think the Nacatl-Muta plan is a lot better here, not to mention it lets us play just 18 lands and therefore draw into a wealth of options during a game. I have to admit that my first impression of the deck when I read the article was, “Why aren’t we just staying the course with Temur Delver?”. I feel that your previous deck was well positioned (as demonstrated by your T8), and that a bit more tuning in terms of the maindeck (and perhaps some testing of a non-Shoal version for midrange-choked metas) would be very productive. Making a Delver deck’s mana base more painful and more fragile (any kind of land interaction does a number on this shell in my opinion) in exchange for a deeper toolbox didn’t strike me as that appealing. On second glance, having the ability to run 8 1-drop beatsticks makes it a bit more palatable, but I remain highly skeptical on how this deck matches up against the likes of go-wide aggro or Burn (which is not the whole meta, but it’s a good part of it). On the other hand, if the extra early threats and deeper toolbox give you more game against combo or midrange, it might be worth it on balance (however, I worry about Nacatl’s lack of evasion in the midrange matchups). I look forward to seeing how this deck measures up against the field, and whether my skepticism is warranted or overly conservative. For the record, I built Temur Delver many months after I first built Counter-Cat. This is a much older deck, and plays very differently. It’s not like I decided to throw four Nacatls into Temur Delver. Nacatl lacking evasion matters a lot less with 4x Path and 4x Mutagenic. If you’re hungry for answers now, check out the link to the MTGS threat in the comments above, which addresses each of your concerns. Otherwise, just stay tuned and I’ll deliver some data-driven content on this deck in the coming weeks; for this article, I just wanted to introduce the deck (hence the article title). Hi Jordan, just wanted to say I am really inspired by all the brewing you do. Monkey Grow is the deck i’ve always wanted to play, but Tarmogoyf has always been out of my price range. My question in regards to this deck though is why run Nactl over the new Dryad? Both are one mana 3/3s and nactl is forcing you to take more damage from your lands. Perhaps it is more for the other spells you get to play like Path/Helix? I think my favourite of your decks is Temur Traverse so I shall try playing it with the new Bedlam Reveller. Also your use of Mutagenic Growth as a Misstep has made me think of using it that way in Merfolk. To often I die to pyroclasm or Bolt/Snap/Bolt on a lord – stopping that cycle at the cost of 2 life seems like an ideal solution to me!